President Paul Kagame will be honored with The World Tourism Award 2017 for Visionary Leadership on November 6, 2017, on the opening day of World Travel Market London, at the Excel Center. 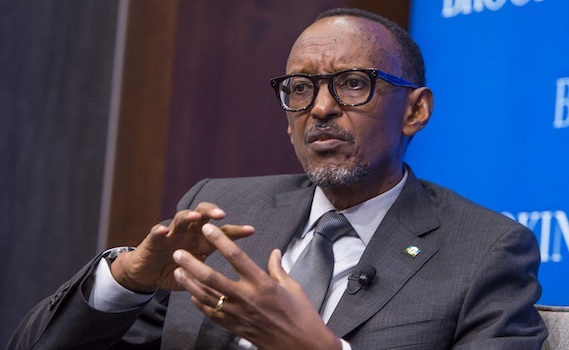 Kagame will be honored at the annual World Tourism Awards ceremony, celebrating its 20th Anniversary, co-sponsored by Corinthia Hotels, The New York Times, and Reed Travel Exhibitions. Peter Greenberg, CBS News Travel Editor and world-renowned travel expert, will host the Award presentation. The World Tourism Award for Visionary Leadership will be presented to President Kagame in recognition of his visionary leadership through a policy of reconciliation, sustainable tourism, wildlife conservation, and economic development attracting major hotel investment, resulting in the remarkable turnaround that has led to Rwanda’s rise as one of the leading tourism destinations in Africa today. Rwanda has achieved remarkable tourism success and has been established on the global stage as a leading sustainable tourism destination in Africa today. Tourism is Rwanda’s number one foreign exchange earner and has played a crucial role in the country’s development. Revenue from tourism has doubled from US$200 million in 2010 to US$404 million in 2016 indicating an annual average increase of 10%, surpassing the National Export Strategy II target in 2016 by 13%. Over 1.3 million tourists visited Rwanda in 2016. Visitor arrivals for the same period (2010-2016) have increased by 12% annually against a backdrop of UNWTO arrivals in global emerging markets bench-marked at 3.3% for the same period. The tourism sector in Rwanda is expected to grow at 15% per annum. As a preferred investment destination, Rwanda has instituted several initiatives to ensure a conducive environment for business. The 5-star Kigali Marriott Hotel offers both style and substance for your visit to Rwanda, with luxurious accommodation and incredible on-site amenities. To date, Rwanda is considered as the 2nd competitive destination for business in Africa according the 2017 WEF Global Competitiveness Report, and this has encouraged even more foreign investment in the tourism sector. Prioritizing infrastructure development within the travel and tourism sector with over $1Billion invested into significant contributors such as RwandAir, enabling it to expand its routes globally to 23 destinations as well as increase its airlift capacity with two new A330 Airbus aircraft. The next major development in this sector is the commencement of the new international Bugesera Airport. The construction of Kigali Convention Center now positions Rwanda as an international conference and meetings destination. The addition of over 1,600 international brands four and five-star lodge and hotel rooms, including Marriott, Radisson Blu, Bisate by Wilderness Safaris and One & Only Nyungwe House, Ubumwe Grande that has been acquired by Double Tree by Hilton has resulted in the creation of over 90,000 jobs in the overall hospitality industry. The villas, main lodge and walkways of Bisate Lodge, Wilderness Safari, Rwanda. The Lodge was built into the side of an eroded volcanic cone, surrounded by lush forest and offer stunning views of the volcanic landscape in the distance. Sustainability is critical to a sound tourism policy and Rwanda has ensured that 10% of all tourism revenue is given back to the communities surrounding the Country’s four national parks. This money is used to fund local priority projects such as schools, health centers and business that promote sustainability benefiting thousands of Rwandans. With Kwita Irina, an annual Rwandan ceremony of giving a name to a newborn baby gorilla, named after the ancestral baby naming ceremony that happened after the birth of a newborn, was created as a means of bringing attention both locally and internationally about the importance of protecting the mountain gorillas and their habitats in Volcanoes National Park in the Virunga Mountains in the north of the country. Rwanda’s Conservation efforts have made a major impact on the growth of the world-renowned mountain gorilla population by 26.3% since the last census in 2010. The Volcanoes National Park in Rwanda is now home to 305 mountain gorillas which accounts for more than half the population in the Virunga Massif. Other conservation milestones in Rwanda took place in the Akagera National Park, where fencing of the park led to a reduction in human-wildlife conflict. Also in Akagera, there was the recent reintroduction of lions and rhinos. There is also a marked reduction in poaching throughout the country, for example in 2013, more than 2000 snares were collected from the park whereas in 2017, only 1 snare was collected. Similarly, in 2017, no arrests were made compared to back in 2013 when more than 200 poachers’ arrests were made. Another major conservation achievement was the proclamation of Gishwati Mukura National Park bringing the total number of national parks to four with 9% of land now managed as protected national parks.